Make sure you remove the face plate and plug into the socket inside the box then run for a few hours downloading and then take the stats again. If no improvement then really it would be better to connect to the router via ethernet just as a test to be 100% sure if it is a wireless issue or a problem with your connection. Last edited by Koala5; 21-08-07 at 02:14 PM. Will do, thanks for all your help people! Hi all, only been in from work a short while and havnt really had time to look at the phone socket. just run the optimizer and thought i'd post the updated stats, I have not got the time right now to change to the master socket and wait for the line to settle. Have my stats improved at all just running the optimizer?? No it can't do that. TCPOptimizer has no effect on the router connection - it only affects the PC it is run on. In simple terms it makes the data "pipe" between the router and the PC the optimum size. Last edited by Saturday; 22-08-07 at 09:37 AM. Fair enough, I will do the connection thingy tonight. Sorry to reopen an old thread but my download speeds are still very slow. I have pretty much followed all the instructions on the forum but i'm only downloading at 50-200 kbps, which for 8m broadband is too slow. Here are my current stats, can somebody give me some advise??? Sky have capped you at 7008kbps for some reason but that won't be the cause of your slow throughput. You didn't answer Koala5's question about wireless. Are you wireless and what do you get wired? Hi, I'm running wireless, but, have tried wired and its the same. I have managed to maintain signal strength at exellent and 54mbps speed so surely this is not the problem. Is there anything obvious on the stats or do I need to contact sky? 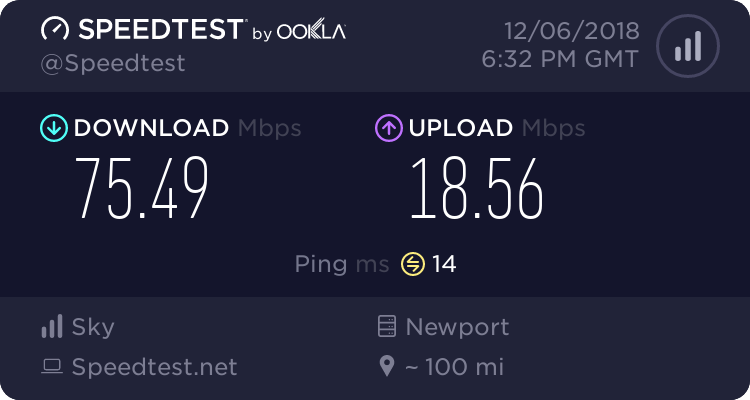 i ran the speed test (large) and got 8 KB/Sec most of the time. The quickest it got to was 22 KB/Sec and then slowly went back down to 8. Total of 10 minutes 8 seconds to download a 15mb file. Do you think I should get onto Sky? Last edited by nif619; 03-09-07 at 04:51 PM.